I fell in love with Indonesian desserts after spending two weeks touring the country. From the lovely Kampung Daun restaurant in Bandung to the treats served on our farewell cruise off Gili Trawangan, and even the little desserts in our boxed lunches, Indonesia loves desserts! I’ll be sharing more about the foods we ate soon, including a roundup of favorite foods from some of my new friends who were on the trip. 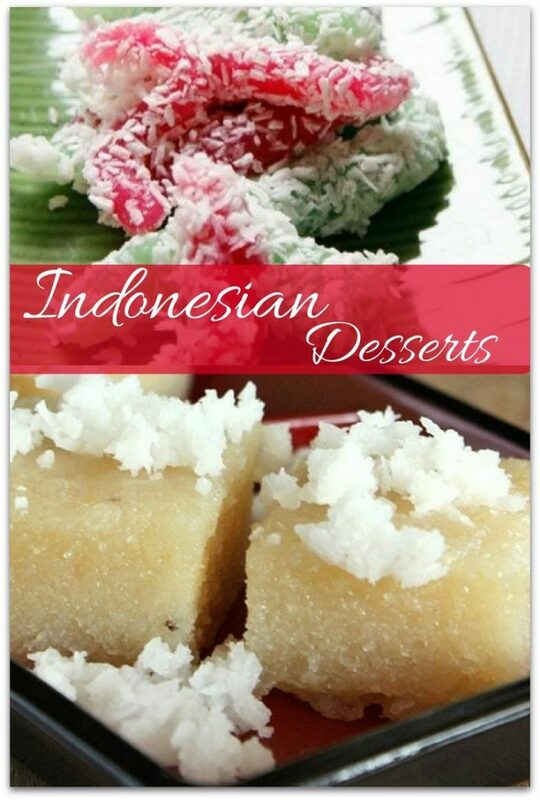 For now, I’ve gathered recipes of classic Indonesian desserts. I’ll be trying a few out soon. Please let me know if you make any of these! Indonesian cuisine takes many cues from other nearby cultures depending on what part of Indonesia you’re visiting. If you visit eastern Indonesia you’ll be eating a mix of Indonesian cuisine with Polynesian traits. However, most Indonesian dishes can be quickly associated with Chinese food. You’ll find plenty of Indonesian desserts which star coconut in different forms. The meat of the coconut is different than the fruits we buy in our local grocery store. The texture is softer and easier to scoop out of the shell. It also gives the desserts a different texture, but one I grew to love. Other popular desserts focus on the regional fruits in Indonesia, like jackfruit or breadfruit. My trip to Indonesia took about 27 hours each way (and worth every hour to get there! ), but with these recipes, you can take a culinary trip to Indonesia without leaving your home! Perhaps after a taste of the foods from this beautiful country, you will want to start planning your vacation to see wonderful Indonesia. Want to learn more about Indonesia? Check out my experience in Bandung where we learned about the traditional games played in this beautiful country.